Hey, everybody! So good to see you here. Shhhh. Don't tell Aunt Charlotte I've snuck onto the blog. Don't let Avery know, either. [She's the author.] We're not allowed in the home office without supervision, but a little snooping is okay, right? I mean, my aunt does it just about everyplace. And I was just in here looking for a pencil sharpener, anyway. I mean, Miss Meredith is heaping on the homework before Thanksgiving break. Heaping. Sheesh! All I wanted to do was finish up my homework and hurry to The Cheese Shop so I could help out. But I got a little distracted. LOL. Welcome to my world. I need to focus more. That's what my dad says. Sheesh. Anyway, I saw the computer on, and well, it's like a lure, isn't it? I may be only eight, but I know there's a ton of stuff on the Internet that's fun to check out. There are all sorts of cheese sites that give me even more information about where cheeses come from and what they're supposed to taste like. Did you know Aunt Charlotte is developing a website for Fromagerie Bessette so she can start selling some of the local farmers cheeses? Two Plug Nickels Lavender goat cheese is to die for!!! Well, maybe not die. I don't want to die. But that's the saying, right? To die for! It's so creamy with a little tang. Yum. Have you ever been to Fromagerie Bessette? It's so much fun. Aunt Charlotte and my dad just redid the whole place. There's cheese everywhere. And little gifts. And crackers and jams. And Daddy sells wine in the annex that's linked to the store. My twin sister, Clair--though we really don't look much alike; she's blonde and I'm dark-haired--she likes visiting she shop, but she prefers to read. She's really, really smart!! I wouldn't tell her this, but I'm really proud of her. That's how smart she is. Me...I'm what my dad calls precocious. [Did I spell that right?] I think it's a good thing. He says it with a smile. Uh-oh. I hear footsteps. Sneaky footsteps. And I don't think it's our sweet Ragdoll cat Rags either. It's Aunt Charlotte. She's getting really good at sneaking up on me! I'd better split. Don't mind me if I twirl on my way out. I do love to twirl! Au revoir, as my great-grandfather likes to say! P.S. If you're interested, click this link to see the author's site. She has recipes on it, like Apple Pie with cheddar crust. And if you have a moment, let me know what your favorite cheese is. I'm always on the lookout for new ones. I'll be sure to let my aunt know. So...what is it? Your favorite cheese. What is it? Hi Amy! My favori--ooooh, I just saw Willow's and now I'm drooling. Mmmm. But my favorite is still Humboldt Fog, which I wouldn't have known about if it hadn't been for your aunt. Yesterday a friend visited, and I sliced up that cheese, an Emmentaler, some Honeycrisp apples and fresh figs, and that was our lunch. He liked the Fog so much, he scraped it all off the plate. I'm still big on Fromager d'Affinois Poivre. Very creamy with that little zing of cracked pepper on top. Hmm, fig jam sounds good, wonder how they would be together? Janet (should I be calling you Miss Janet? I call my teacher Miss Meredith...don't tell Charlotte if I'm making a big faux pas, okay?) Anyway, Janet, Brie and pecans sounds great! I’ve got to try that. Thank you so much for stopping by. Laine, I know what you mean about Humboldt Fog. I’ll be sure to tell Aunt Charlotte that you like it. She’ll be so glad to know. Thank you so much for dropping me a note. I love brie! I used to live in France (Grenoble, freezing cold but gorgeous mountain views) and there was a fromagerie right next door to our apartment. Baguettes, brie, home-made soup and some red wine made a dynamite dinner. Somehow it made the freezing temperatures more bearable! Oooh, Krista, I now love Fromager d'Affinois Poivre, too!! 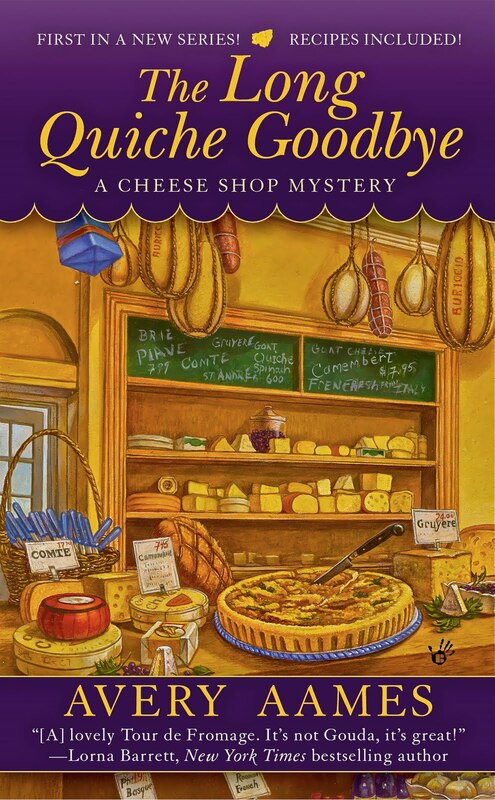 My author, Avery, told me about your favorite cheese, and I didn't even know we had it in The Cheese Shop, but we do, so I tasted it. I thought I'd tasted everything, but I'm only eight, so I probably haven't. I bet it would taste good with pepper and fruit. Sometimes zing with sweet is so…well…yummy! Bad news, Amy. Avery knows you're on the computer. Run, honey, run! Mary, you lived in France? That's so romantic! I can't have any red wine, but I know I'll like it when I can. My daddy will probably teach me about it. He used to be a sommelier. Now he is partners with my Aunt Charlotte at Fromagerie Bessette. Bye, for now! Whew, that was close! Thanks, Krista, for the heads up!!! I got out just in time, but Avery is gone now. She's writing. Can you imagine? On a Saturday? Hi Amy - You're lucky to have such a wonderful aunt - and such a clever one too! I've used many of her recipes and they're all delicious. My current favorite (I go through phases) is Roquefort -- yum! Hannah, so nice to meet you. I like Roquefort, too. Have you tried Crater Lake Blue from Rogue Creamery? It's delicious. Tangy with a buttery finish. Yum. Oh, by the way, the author, Avery, has posted recipes on her website, and she blogs recipes, too. I've added the links below. :) Have a great day. It's late and I hope that you, Amy, is in bed now. My favorite cheese is Fontina. Good night Amy, it was nice of you to visit. My favorite is Camembert. I don't get to have it very often because I have to count calories (something you are too young to worry about). But it's a real treat when I do.